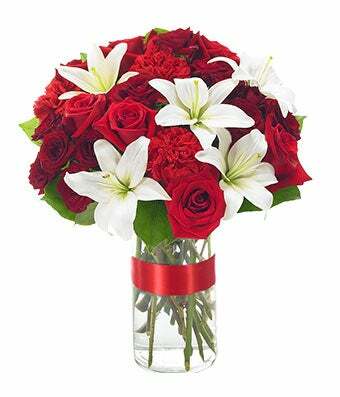 The Elegance Bouquet makes for a lovely holiday or Valentine's Day gift with its red and white blooms. Gorgeous red carnations and roses are arranged with white lilies and seasonal lush greens. Decorated with a satin red bow, the vase and bouquet are available for same-day delivery. Measures 15"H by 13"L.